Allosaurus was the lion of the Jurassic. Though it was much smaller than the likes of say Tyrannosaurus Rex, it was still the largest predator in its environment and preyed upon some of the mightiest animals ever to live on the planet such as the gigantic Sauropods. At one point it was one of the most famous of Dinosaurs. It was the other cruel king of the Dinosaurs alongside T-Rex but sadly in recent decades it has been somewhat usurped in popular culture by other giant killers such as Giganotosaurus and Spinosaurus. Still we know more about Allosaurus than most other Dinosaurs as there have been considerably more skeletons discovered of the beast over the years than the majority of other Dinosaur species. Allosaurus was a medium (by Dinosaur standards) sized carnivore. It could reach a maximum length of 39 feet long, with a height of 13 feet and a weight of 2 tons. Allosaurus lived during the Jurassic period 150 million years ago. It belonged to a group of large meat eating Dinosaurs called the Allosaurs who flourished throughout the Jurassic period and the early to middle Cretaceous. 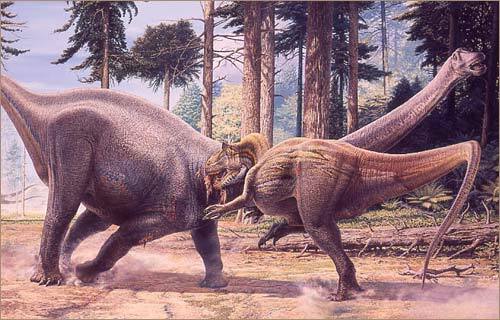 They also included Giganotosaurus and Carcharodontosaurus two meat eating dinosaurs larger than T. Rex itself. Allosaurus lived alongside other giant predators such as Ceratosaurs which it most likely dominated. It also lived alongside giant herbivores such as Diplodocus, Apatosaurus and Stegosaurus all of which it may have preyed on. Allosaurus was first discovered during the middle of the bone wars in the late 19th century. The first bone fragments were found in the year 1869, but it was not named until the year 1877. It was called Allosaurus Fragilis by Othneil Marsh which means Odd or different lizard. It was originally thought that female Allosaurus’s were larger and more powerful than the males, but the evidence for this is no longer considered valid. Now no one knows whether the males or female were larger for any species of Dinosaur. It is possible that males may have been larger like most modern day reptiles and birds the living relatives of the Dinosaurs, or its possible that like modern raptors (birds of prey) the females may have been bigger. Scans of its brain case reveal that its brain was virtually identical to that of a modern day Alligator meaning that it most likely would have behaved in a similar fashion and had similar levels of intelligence. Alligators have a higher level of intelligence than certain species of cats and dogs and thus Allosaurus most likely would have too. How Did Allosaurus Kill Its Prey? Allosaurus was most certainly a predator. There are several pieces of direct evidence for this. A stegosaurus skeleton has been found with an Allosaurus bite mark on one of its plates that has healed whilst at the same time another Allosaurus skeleton has been found with slash marks from a Stegosaurus tail that have similarly healed. There have also been footprints discovered made by a large sauropod Dinosaur with the footprints of an Allosaurus following behind. Several other Allosaurus specimens have been found with broken bones and gruesome injuries that have clearly been gained in conflicts too. Whilst some may dismiss these as rare occurrences its important to remember that given how rare the fossil record actually is this seems unlikely. In order for so many cases of active predation by Allosaurus on other animals to be preserved it would have to be happening fairly regularly. Whilst Allosaurus was a predator it had a very different method of killing its victims than Tyrannosaurus Rex. Tyrannosaurus Rex relied on sheer brute strength. It had a bite force of over 23 tons greater than any other animal ever to live on the planet. Allosaurus in comparison had a puny bite force smaller than even modern day predators like Great White Sharks, Alligators, Lions and Leopards. The reason for this was because Allosaurus didn’t need a massive bite. Instead it would swing its head like a hatchet at its victims which allowed it to cleave off massive pieces of meat. 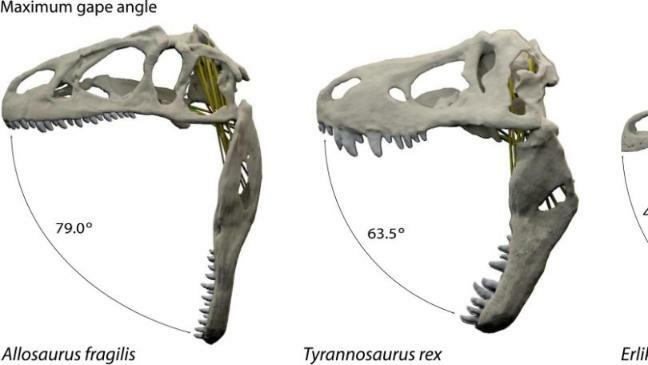 In order to do this more effectively Allosaurus could not only open its jaws far wider than other meat eating dinosaurs but its skull was also much stronger and more reinforced in order to withstand the stresses of this. Allosaurus could open its mouth even wider than T. Rex. 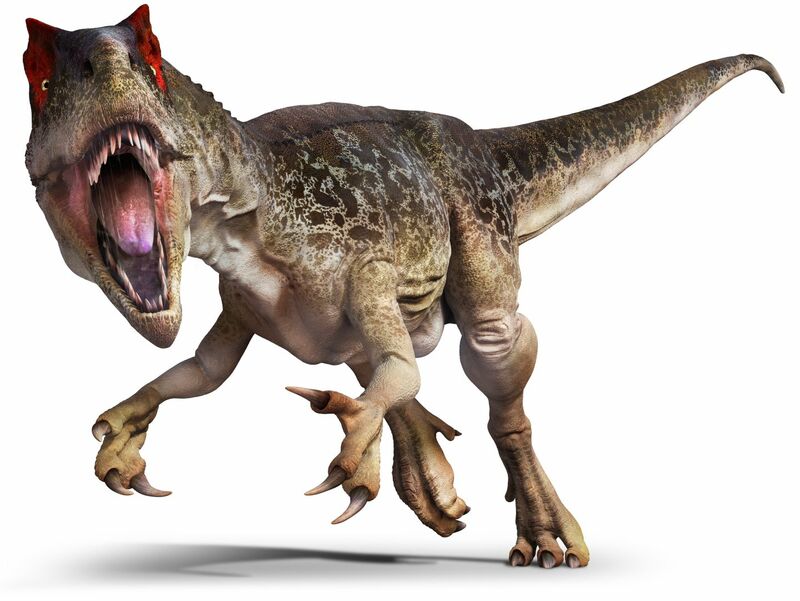 Allosaurus also had massive claws on its fore arms which were longer than those of Tyrannosaurus. It was also the fastest of all the large meat eating Dinosaurs. Allosaurus could run at 35 miles per hour. That’s faster than any large animal today. Elephants can only run at 10 miles per hour, Rhio’s can only run at 25 miles per hour and most big cats can’t go as fast as 35 miles per hour either. Only Ostriches which can run over 40 miles per hour and Cheetah’s which can run over 80 miles per hour can run faster than an Allosaurus. Aside from being fast it was also very agile and manoeuvrable. It could jump over 12 feet in the air and was very light on its feet too. Finally as if that wasn’t enough Allosaurus also was very strong and durable. They could survive injuries that would have killed other animals. One specimen, a sub adult nick named big Al had 18 major injuries including smashed ribs all of which had healed. All of this factors made Allosaurus a very effective predator. In order to hunt the giant sauropods it most likely would have used its incredible speed and agility to quickly leap through the air and jump onto its victims side. There it would have held onto them with its claws and slashed at them with its hatchet like jaws tearing massive chunks of flesh from its victims. It would have repeated this process again and again using its agility to dodge its victims attacks until it brought its prey down from shock and blood loss. There is also a possibility that Allosaurus may have hunted in packs too. There have been many Allosaurus specimens that have been found together, but all this proves is that they died together. Still some modern day Crocodillains are known to band together when hunting big game. One Crocodile will push a Zebra into the water whilst another will pounce on it. Since Allosaurus’s had comparable intelligence to modern day Crocodillains then it is perfectly believable that they may have applied similar tactics to take down the biggest sauropods who would have been too large for a single Allosaurus to take down on its own. Being the largest carnivore in its environment Allosaurus would have naturally been the apex predator too and thus would have dominated any other big carnivore such as Ceratosaurus too. It truly was the Lion of the Jurassic. Great article. I think the Allosaurus is under-represented in modern dinosaur flicks and I hope they will get a shot in the next Jurassic world movie.